Research has shown that during the December-January holiday period, substance abuse problems can emerge and/or be exacerbated. Brenda Iliff, Clinical Director of Hazelden in Naples, FL, discusses substance abuse problems and relapse during the holidays in an interview posted on Recovery Resource BLOG. Holiday substance abuse problems not only affect individuals and families, but also have a major impact on public health and welfare. 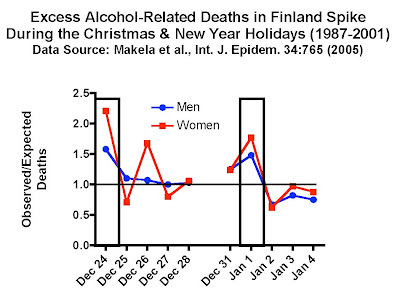 Consider for example some statistics on holiday alcohol-related fatalities from Finland and from the United States. A study by Makela and colleagues reported that in Finland over the 15-year period from 1987-2001, alcohol-related deaths spiked on Christmas Eve and New Years Day in men (58 and 48% increases, respectively) and in women (121 and 77% increases, respectively, see the figure). Comparable statistics on alcohol-related traffic deaths in the US from 2001-2005 were reported by the US National Highway Traffic and Safety Administration (NHTSA), and showed that alcohol-related fatalities were 25 and 50% higher during the 3 to 4-day holiday periods surrounding Christmas and New Years Day, respectively. The Office of National Drug Control Policy (ONDCP) in its Of Substance Blog suggested that party hosts plan to offer guests non-alcoholic beverage choices, and even provided several alcohol-free drink recipes to consider. In addition, a number of anti-alcohol media campaigns targeting holiday drunken driving are underway, including one highlighted by the Addiction Inbox BLOG. Alcohol seems to be the main holiday-related substance abuse problem. However, the Substance Abuse and Mental Health Services Administration (SAMHSA) reported that in 2009, 10 million people drove while intoxicated with prescription or illicit drugs (compared to 30 million people drove while alcohol-intoxicated). In fact, in some age groups, the prevalence of drugged-driving exceeds that of drunk driving. Although statistics do not seem to be available yet clarifying whether drug-intoxication deaths (driving or otherwise) increase during the holidays, this week, President Obama issued a Proclamation naming December 2010 as National Impaired Driving Prevention Month, with a focus on preventing drunken and drugged driving. CPDDBLOG welcomes CPDD member’s thoughts on this issue, thanks you for looking in over the past few months, and wishes you and yours a happy, healthy, prosperous, and especially a safe holiday season and new year. MIAMI, Fla. — Presentations were made yesterday afternoon to attendees of the ACNP 49th Annual Meeting by Tom Insel, Director, National Institute of Mental Health (NIMH), Kenneth Warren, Director, National Institute on Alcohol Abuse and Alcoholism (NIAAA), and Nora Volkow, Director, National Institute on Drug Abuse (NIDA). The Institute Directors briefed ACNP meeting attendees on Institute priorities and budget issues. Dr. Insel spoke first and focused on strategic and budgetary themes. He remarked that there is some frustration in Congress regarding the return on the financial investment that has been made to support research. He suggested that NIH research needs to become more like the research program maintained by the Defense Advanced Research Project Agency (DARPA), that works off of directives and is focused on innovation. He reported that NIMH Council recommended that it is important to stop conducting large studies that yield small effects, and that there should be a focus on methods standardization, data integration, and data sharing. Insel also noted that NIMH is committed to preserving the New Investigator R01 pipeline, and this year is funding New Investigator R01s up to the 25th percentile. In terms of budget issues, he said that the President’s FY11 budget proposed increased funding by 3.2%, but that actual budget increases have been below the level of inflation for the last 5 budget years. Importantly, only a fraction of each year’s budget, ~25% for NIMH, goes into new awards, with ~75% already committed to existing programs. If the President’s FY11 budget is approved, then the current funding line for new applications would be ~21% funding. However, because Congress is working on a Continuing Budget Resolution, the current funding line is ~17.8%. And, if the budget is funded at FY08 levels, the preference of some Congressional leaders, the new application funding level would reduce to a scary ~13.3%. This could mean a ~30% cut in the number of newly funded projects. To offset this grim possibility, Insel mentioned that NIMH is considering a number of options including shifting some resources from intramural to extramural programs. He remarked that we are in the best of times scientifically and the worst of times financially. Dr. Kenneth Warren of NIAAA spoke next and noted that he was glad to be speaking after Dr. Insel, who provided a perspective on a budget environment that affects all NIH Institutes. Dr. Warren outlined the NIAAA mission and reported that the President’s FY11 budget request for NIAAA called for a 2.7% budget increase but the Senate markup called for only a 2.5% increase, both below inflation levels. He then noted that the final budget could be flat or worse than flat. Dr. Warren then spoke about the Scientific Management Review Board’s recommendation to form a new addiction research institute, and noted that the NIH Director appointed a task force to be led by NIH Principal Deputy Director Lawrence A. Tabak, D.D.S., Ph.D. and National Institute of Arthritis and Musculoskeletal and Skin Diseases Director Stephen I. Katz, M.D., Ph.D., to develop a new institute model by summer 2011. Warren remarked that he had been told that those appointed to be task force members would “have no skin in the game”, presumably to eliminate conflicts of interest, but he expressed concern that the task force may not have all the expertise needed to formulate an optimal structuring plan. Dr. Warren urged the audience to volunteer their time and advice, if requested by the task force, to consult on the structuring plan. He then outlined a the timeline for the process, indicating that the structuring plan would have to be completed by summer 2011 in order to be able to start in FY 2013. Dr. Warren spent the balance of his time discussing NIAAA accomplishments and priorities. NIDA Director Dr. Volkow spoke last, agreeing with Dr. Insel in that these are extraordinary times scientifically. She remarked that science is advancing at speeds not seen before because of open access to research data via the internet. She termed the budget picture “challenging” and “competitive”. She noted that the proposed NIDA budget is about $1 billion, but could be rolled back to FY2008 levels. NIDA is considering a pre-emptive measures to respond to this possibility, and among other actions is not going to commit to new large program projects that run for long time periods. She then focused on the SMRB recommendation to form a unified addiction institute, and indicated that she was “delighted” with the recommendation. Dr. Volkow said that in her opinion, dividing research on alcohol from that on other drugs is bad, because of the high comorbidity between alcohol abuse and abuse of nicotine and illicit drugs. Dr. Volkow noted that most animal models of alcohol abuse don’t include nicotine, which is relevant clinically and scientifically because of the high comorbidity of alcohol abuse and smoking, and because nicotine is neuroprotective and also can trigger alcohol relapse. She noted that more alcoholics die from smoking-related diseases than from alcohol-related diseases. She observed that supporters of NIAAA and NIDA research programs all are afraid that funding for these research areas will be reduced in an integrated institute, and that it will be critical to include mechanisms in a new institute structure that minimize inappropriate allocations. Dr. Volkow lamented that the restructuring process has resulted in a polarization between NIDA and NIAAA, but that it is important to start working together to figure out how to best integrate resources and manage the change. She also appealed to the audience to serve as consultants if asked to help provide guidance on integration. So, the Food and Drug Administration (FDA) has been regulating tobacco products for a number of months now and recently banned the sale of caffeinated alcoholic beverages. This past week, the Drug Enforcement Administration (DEA) placed temporary controls, effectively, a 1-year ban, on possession or distribution of synthetic marijuana, also known as “fake pot”. The ban will allow a period of study to determine whether these fake pot products should be permanently controlled as Schedule I drugs. These and other synthetic marijuana products already are banned in a number of European countries. 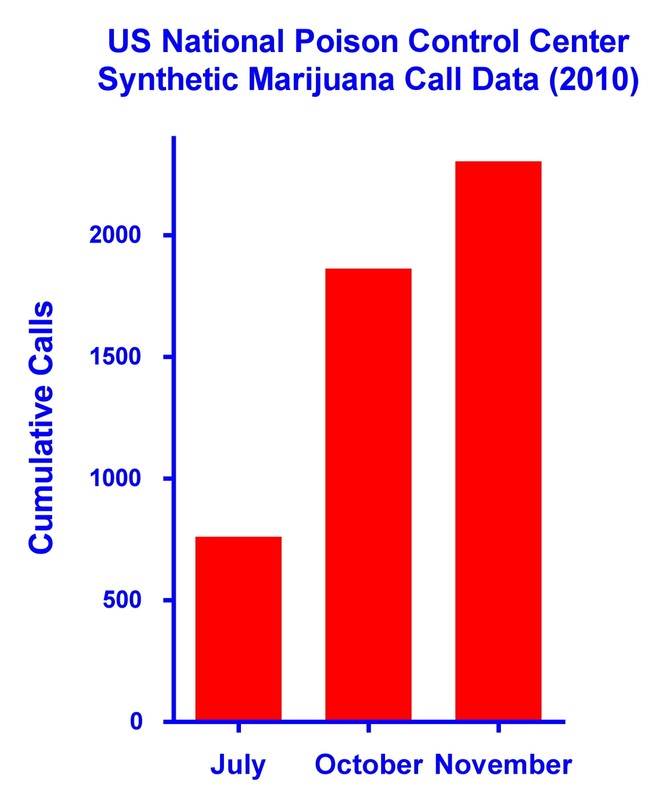 Synthetic marijuana is produced by spraying herb blends to be smoked with one or more of the following chemical substances, JWH-018 or analogs JWH-073 or JWH-200, or CP-47,497 or analog cannabicyclohexanol. 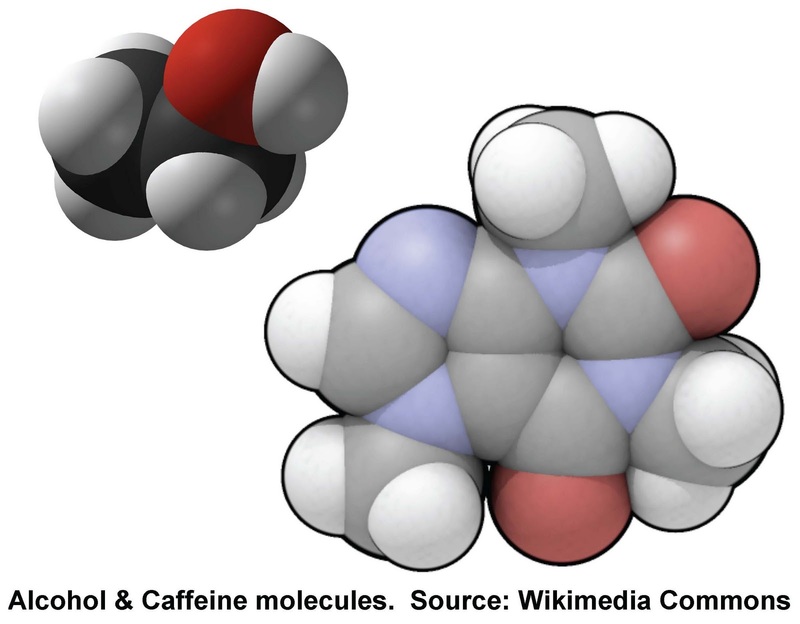 The JWH series of compounds were initially synthesized for research purposes by medicinal chemist John W. Huffman. Together with Billy Martin and colleagues, Dr. Huffman published a pharmacology study in Drug and Alcohol Dependence showing that JWH-018 and JWH-073 have high affinity at cannabinoid CB1 and CB2 receptors, and are several times more potent at binding to these receptors than the primary active ingredient in marijuana, delta-9-tetrahydrocannabinol (THC). Compound CP-47,497 is another synthetic cannabinoid synthesized originally by Pfizer. The American Association of Poison Control Centers issued 3 press releases this year in July, October, and November, reporting alarmingly high numbers of calls to Poison Control Centers related to these products (see Figure), particularly when compared to the small numbers of calls received in prior years. In his NPR interview, Dr. Huffman pointed out that there are many other synthetic THC analogs with similar effects, some of which are many times more potent than THC. Thus, more products like the banned substances likely will emerge pretty quickly and may need to be studied and possibly regulated. At the CPDD Annual meeting held in June, Boos and colleagues from the DEA reported finding synthetic cannabinoids more frequently of late in seized products (Abstract 59, 2010 Abstract Book PDF page 15, downloadable at www.cpdd.vcu.edu). Their abstract indicated that since 2000, 5 designer drugs have been added to the controlled substances act. That number could be quickly doubled if the 5 synthetic cannabinoids under discussion also are added, and could grow even further and very quickly if other synthetic cannabinoids are added. 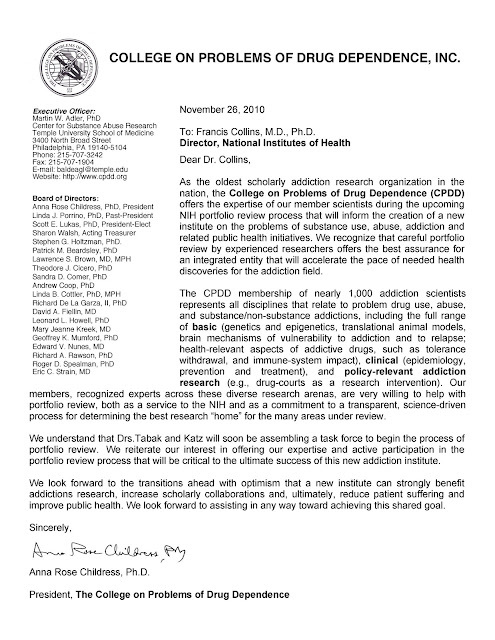 Yesterday, NIH Director Francis Collins issued a statement regarding a possible reorganization of NIDA and NIAAA indicating he had received the formal reccommendation from the Scientific Management Review Board to formulate a new addiction research Institute. The statement indicated that a task force is being formed to determine which programs among NIH's 27 Institutes would be moved to the new Institute, and which programs currently within the portfolios of NIDA and NIAAA would be moved to other Institutes. Drug Monkey published a interesting discussion of the process. In follow up to the last posting on caffeinated alcoholic beverages, more states and colleges have enacted or are considering bans of these types of beverages. The State of Michigan now has banned sales of these drinks effective next month, the State of Oklahoma halted sales of Four Loko and similar beverages, and the State of New York State Liquor Authority is considering modifying the state law so they can ban these types of drinks. These are in addition to the State of Utah, which never permitted sales of these types of beverages. In addition, the University of Rhode Island has banned these beverages. Some feel that these beverages are marketed in such a way that they are attractive to adolescent drinkers, in whom the combination of caffeine and alcohol may be particularly problematic. Prescription Drug Abuse, the DEA’s “Take-Back” Initiative, and CPDD research. BOSTON, MA – In New England alone, over 25,000 pounds of prescription drugs were collected this past Saturday from 401 of the 4000 locations participating in the Drug Enforcement Administration’s (DEA) national “Take-Back” program, the first of planned bi-annual events. R. Gil Kerlikowske, Director of the White House Office of National Drug Control Policy (ONDCP), visited one of the Take-Back sites in Philadelphia during the event and pointed out that “More than 70 percent of people who abuse prescription drugs get them from friends or family…” National Public Radio had an interesting interview focusing on the event, noting that prescription drug abuse affects all socioeconomic levels. Statistics regarding the DEA Take-Back program’s success along with grim statistics about the prevalence and consequences of prescription drug abuse can be found on the DEA, ONDCP, and National Institute on Drug Abuse (NIDA) websites. Prescription drug abuse has become a major public health problem, eclipsing most forms of illicit drug abuse and catalyzing a spike in criminal activity. A report in the New York Times noted that some people now show up at real estate open houses not to look at homes but to search medicine cabinets for pain pills. CPDD researchers are making progress in understanding the scope of the problem, its causes, and in finding possible solutions. A number of abstracts presented at the 72nd Annual CPDD meeting in Scottsdale focused on prescription drug abuse. For example, researchers from Michigan State University reported that more than 3% of people who took prescription pain medications for nonmedical purposes developed dependence soon afterward, and 20% developed some features of dependence (Adelaja et al., CPDD abstract book PDF, page 2). To view this abstract and other abstracts on this and other topics, download the CPDD meeting abstract book PDF (2nd link under the 2010 "MEETING INFO..." heading on the left panel). 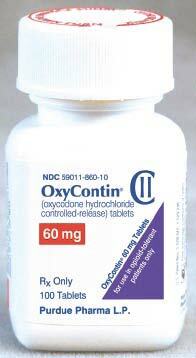 And, the epidemic extends to other types of prescription medications. In this regard, a recent report in CPDD’s journal Drug and Alcohol Dependence described how non-prescription stimulant use also has been associated with rapid development of dependence at alarmingly high rates. Clearly, much work needs to be done to stem the tide of prescription drug diversion and abuse by agencies that control the flow of prescription drugs and by researchers working to find new medications that are less likely to be abused. Formation of a new Addiction Institute: what could this mean for NIDA and NIAAA training programs? 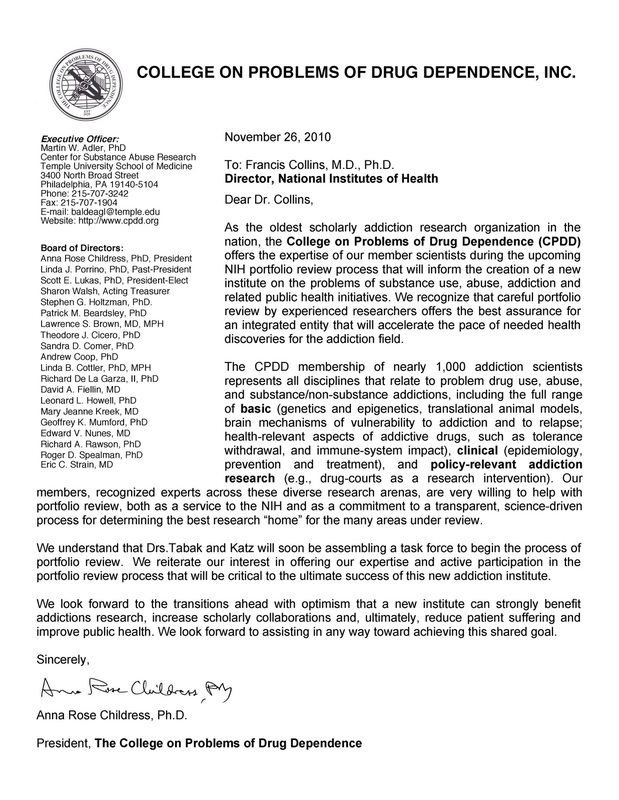 The Substance Use, Abuse, and Addiction Workgroup (SUAA) of the Scientific Management Review Board (SMRB) recommended last Wednesday (September 15, 2010) to dissolve NIDA and NIAAA and form a new Addiction Institute, which would oversee all NIH-funded addiction related research from those Institutes. In addition, addiction-related research currently within portfolios of other NIH Institutes would be moved to the new Institute. Although NIH Director Collins has yet to act on this recommendation, people are beginning to speculate on how consolidation would affect existing NIDA and NIAAA programs, including existing training programs. Currently, there are more than 60 NIDA-supported training programs and 28 NIAAA-supported training programs. 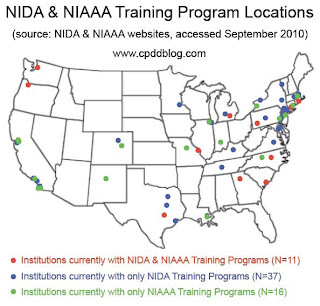 The map shows the approximate geographic locations of institutions supporting training programs for NIDA, NIAAA, and for both Institutes. 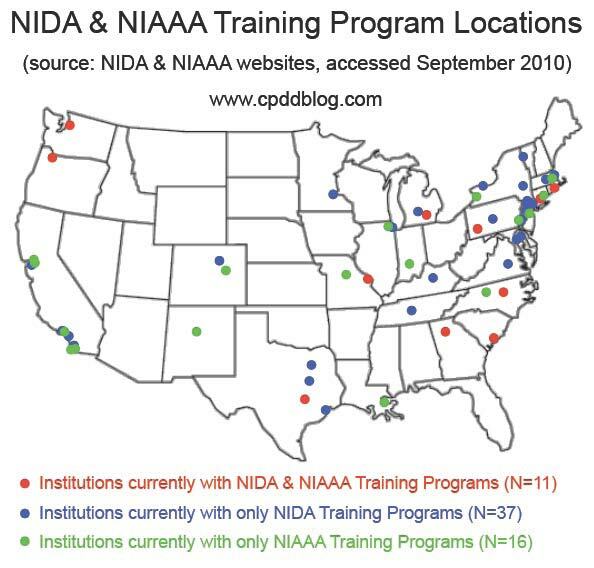 Of note, only 11 of 64 institutions currently with NIDA or NIAAA training programs support NIDA and NIAAA programs, meaning that simply merging existing training programs is not going to be an effective strategy to achieve the interdisciplinary training goals outlined in the SUAA report. So, people are wondering how training programs would transition to become more interdisciplinary in structure. Another question people are considering is the time frame over which existing training programs would be required to migrate their curricula (and possibly) faculty to become more interdisciplinary. Would transitions have to occur within training program funding cycles or by the time of the next competing renewal application? And, since research is a key component of training, what would happen to programs based at institutions not having established NIDA- and NIAAA-supported research programs? What would happen to trainees starting under the current system—would they be allowed to complete their program or would they have to develop more interdisciplinary competencies? Obviously, there are many details that would need to be worked out to get from where we are to where the SUAA recommends we should be, should NIH Director Collins accept that recommendation and form a new Addiction Institute. CPDDBLOG welcomes CPDD member’s thoughts on this issue, especially members currently affiliated with training programs. Vote for Option 1, a structural merger (recommendation to form a new addiction institute): carries, 12 in favor, 3 against. This recommendation will be reviewed by NIH Director Francis Collins, who will determine next steps. I have been asked to contribute to the CPDD blog regarding the College’s journal, Drug and Alcohol Dependence (DAD), as the new Editor in Chief of the journal. I’m pleased to do so, and to outline a couple of the changes that have occurred over the past few months with the journal. First, there have been several changes in the ranks of the Associate Editors (or AEs). I should explain that the AEs for DAD are true editors – each manages all aspects of their assignments. I assign a new submission to an AE, but after that the AE invites reviewers, keeps track of getting reviews, makes decisions about whether to continue to consider the paper, and gives the authors feedback. There are now seven AEs for DAD (and their topic areas follow each name): Deborah Hasin (Comorbidity, Psychiatric Epidemiology, Etiology, Nosology and Genetics); Kyle Kampman (Treatment and Services); Lin Lu (Neuropsychopharmacology and Treatment); Linda Porrino (Preclinical and Clinical Neuroscience); Craig Rush (Behavioral Pharmacology); Steffanie Strathdee (Etiology, Epidemiology, Prevention and Policy); and, Wim van den Brink (Etiology, Treatment and Human Genetics). Craig, Lin, Linda, and Kyle are all new AEs as of this summer. Another change in the wings is that the Instructions to Authors has recently been revised and updated. Some of these changes are minor (such as fixing urls), but there are a couple of note. One is that we are now asking that all abstracts be structured. The second is that there are guidelines for word limits to papers. We previously had a word limit for Short Communications (2000 words), but now have added recommendations for Regular Articles (4000 words) and Reviews (6000 words). We also are now encouraging authors to suggest reviewers when they submit a paper. Another change is by the College, which has decided to no longer provide a paper copy of the journal to members as a membership benefit. I’ll let the College fill you in on this change, but it looks like members will no longer get the paper copy starting in January of 2011. I want to end by encouraging all to be involved with DAD – the journal publishes terrific work, and it is seeking the best work from all fields of addictions research. I hope that you will read the journal, submit your papers, and agree to help review. I believe that addictions research is stimulating, challenging, and exciting – it brings together neuroscientists, clinicians, epidemiologists, policy makers, and countless others, all interested in bettering our understanding of substance abuse. Don’t hesitate to let me know how DAD can further help to move our field forward. 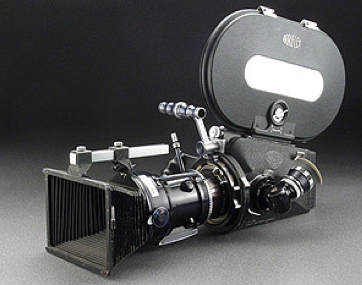 CPDDBLOG welcomes CPDD member’s thoughts on this posting.